Kate Wright enjoyed a night out with her new fiancé Rio Ferdinand to celebrate his 40th birthday at Manchester’s Rosso Restaurant on Saturday. While the former TOWIE star, 27, caught the eye with her cushion-cut engagement ring, she sported a wrist brace to support her dislocated joint following her injury in September. The TV personality ensured all eyes were on her as she slipped her gym-honed frame into a plunging burgundy bralet, flashing a hint of her toned abs. Upping the style ante, the reality star rocked a quirky asymmetric checked skirt, which featured a racy thigh-high split. Kate commanded attention with her footwear as she donned a pair of bedazzled strappy heels, which displayed her red pedicure. Living up to her show-stopping appearance, the Essex beauty accessorised with a gold handbag, a pendant necklace and diamond stud earrings. Kate framed her stunning visage with loose waves, and enhanced her beauty with gold-toned make-up. In September, Kate revealed she’d broken two bones and dislocated a wrist in a snap of her bandaged arm while recovering in bed. 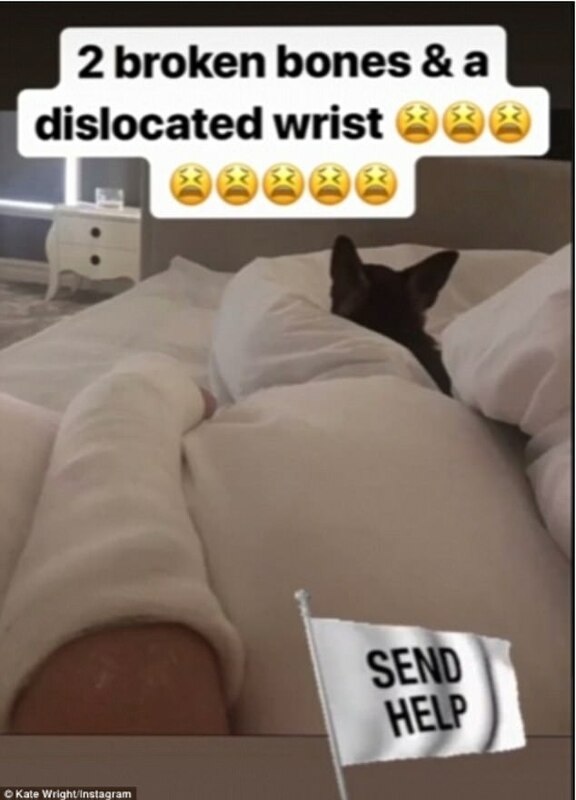 Although she shared the telling picture on her Instagram Story, the erstwhile reality star opted against revealing how she came to sustain the painful injury. Meanwhile, Rio, who turned 40 on Wednesday, looked dapper in a sleek black suit, teamed with a white pocketsquare and striped tee. The footballer opted for comfort in the footwear department as he donned a pair of box-fresh trainers. The pair were joined by an array of their pals, including TOWIE’s Saffron Lempriere, who took a walk on the wild side with her leopard print dress. 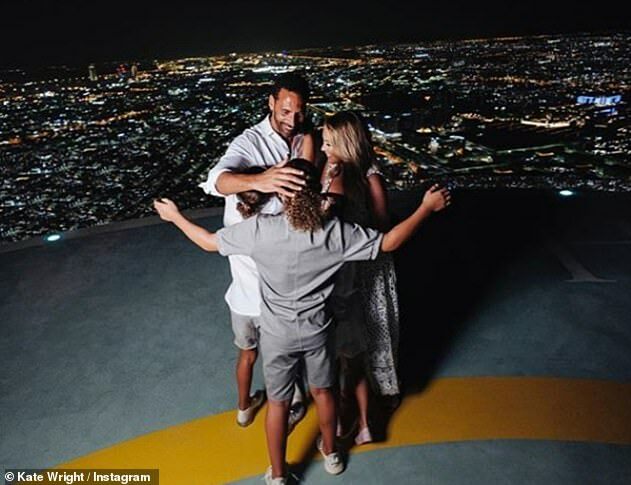 Their appearance comes days after the former ITV star accepted the romantic rooftop proposal from the sports legend during a family holiday to Abu Dhabi after he popped the question. Rio carried out the marriage proposal in front of his three children Lorenz, 12, Tate, 10, and Tia, seven, as it was revealed the footballer was given the blessing of his late wife Rebecca to find love again. Kate uploaded three pictures of the magical moment Rio popped the question as Lorenz and his siblings Tate and Tia looked on. The stunning cityscape images appeared to have been taken on a rooftop helicopter pad following a night-time ride. Rio’s three children could be seen looking on as their dad proposed, before rushing over to hug them both when Kate accepted. The former England star proudly revealed he had included his kids in his proposal plans, and praised them for keeping the secret for so long. The reality star started dating Rio in early 2017, two years after he tragically lost his wife Rebecca Ellison, 34, following a short battle with cancer. Rio revealed last year that Rebecca had encouraged him to find love again once he passed, in a conversation with her friend Lisa. He told The Sun: ‘Rebecca told Lisa something in the final weeks of her life. Months later Lisa told me what it was… “It kills me to think of Rio with a new partner, Lisa, you know it does. Of course it does. The football pundit also spoke about the positive impact Kate has had on his children since the tragic passing of their mother.